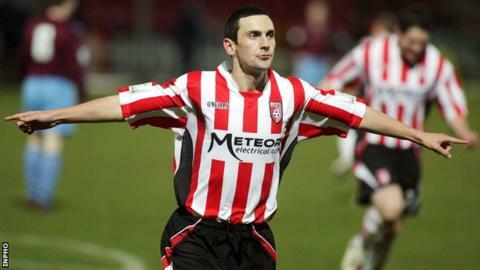 The family of former Derry City striker Mark Farren are appealing for financial help after he recently underwent a third brain tumour operation. Farren's family want to raise around £25,000 which would enable him to travel to a cancer centre in Germany. The ex-Derry City striker turned 33 on Friday and a statement from his family said his former team-mates Kevin McHugh, Ruaidhri Higgins and Ciaran Martyn would be leading a number of fund-raising activities in the coming weeks. "The six-week treatment programme is his best chance of saving or at least prolonging his life," added the Farren family's statement. "Treatment will cost approximately €30,000. This is the one goal with which Mark needs our help, any contribution is greatly appreciated." Donegal man Farren was named the League of Ireland players' player of the year in 2005 and went on to become Derry's record goal-scorer in 2012 before joining Glenavon in 2013.